NETWORK UPDATE: The only change from Friday’s preliminary ratings was a 0.1 dip for the 8:30PM rerun of WHOSE LINE IS IT ANYWAY on CW. ESPN’s NBA BASKETBALL coverage took over the top 2 cable slots on Friday night at 1.70/1.30. GOLD RUSH (Discovery) lost a tenth to 1.07, and was followed by EDGE OF ALASKA, down 0.13 to 0.51. On Syfy, WWE was down 0.04 to 0.57. Its lead-in HAVEN lost a hundredth to 0.19, and lead-out Z NATION lost 0.06 to 0.38. KENDRA ON TOP (We) dropped 0.17 to 0.35. REAL TIME WITH BILL MAHER (HBO), perhaps fueled a bit by the controversy over Maher’s Berkeley commencement speech invitation, gained 0.07 to 0.28. ON THE MENU (TNT) edged down 0.01 to 0.09. ESPN’s COLLEGE FOOTBALL game fell two-tenths to 0.16. 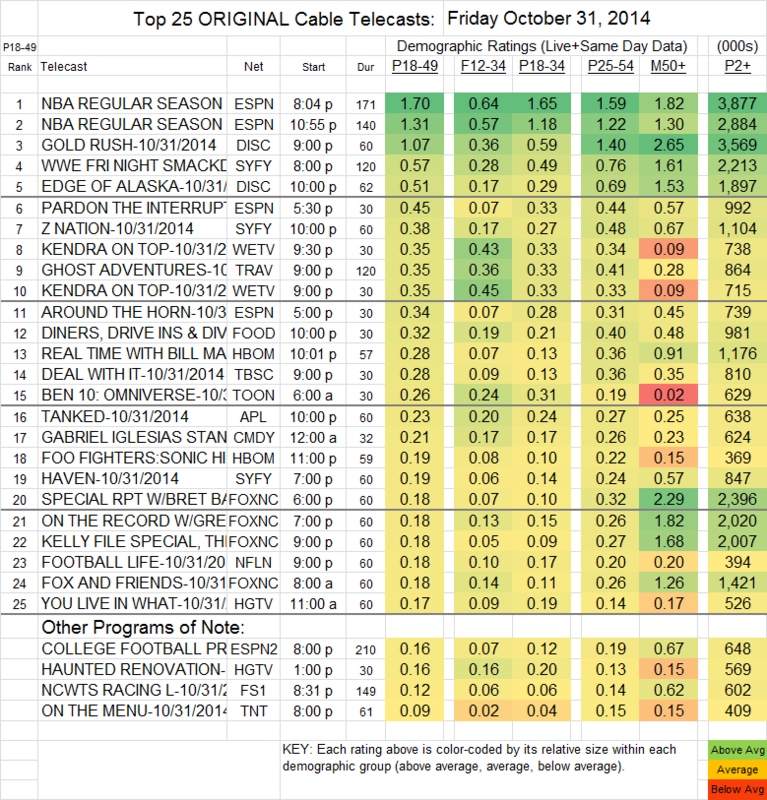 On IFC, COMEDY BANG BANG was at 0.05/92K viewers, while BIRTHDAY BOYS was at 0.03/61K.